The tiny dwarf planet is full of surprises, this time behaving like a weird hybrid comet-planet. Poor little Pluto was much maligned in (some) scientific circles—that is, before the arrival last year of NASA’s New Horizons probe. First, its reputation as a planet was questioned; then it was humiliated by being ejected from the classical roster altogether; then it was kicked while it was down with various astronomical attacks—some said that it is little more than an unusually large comet, others said that it is simply the biggest specimen of a family of unremarkable Kuiper Belt Objects. But Pluto’s reputation has made a comeback lately. Last summer’s flyby revealed, not a dead and dull comet core swinging through the outer reaches of the Solar System, as some expected, but an active world full of floating hills, weird atmospherics, giant mountains, and proverbial rivers of liquid nitrogen. Now the probe’s got something to say about Pluto’s interaction with the solar wind, which is the vast outflow of charged particles that streams from the Sun’s surface, and buffets the planets at speeds upwards of 160 million kph (100 million mph). It was thought that Pluto would resemble a giant comet in its interactions with the solar wind, with a gentle slowing of the wind, in contrast to the planetary-type abrupt division much nearer the planet’s surface. Instead, it’s kind of a hybrid—somewhere in between the two. New Horizons’ Solar Wind Around Pluto (SWAP) instrument detected a long, Earth-like “ion tail” sweeping away from Pluto for a distance of some 118,700 km (73,800 mi), consisting of methane ions being stripped from Pluto’s atmosphere. As far as the dwarf planet’s leading edge, the solar wind isn’t stopped until about 3,000 km (1,844 mi) from Pluto’s surface—which is considerably nearer than thought. “These results speak to the power of exploration. Once again we’ve gone to a new kind of place and found ourselves discovering entirely new kinds of expressions in nature,” explained New Horizons principal investigator Alan Stern. 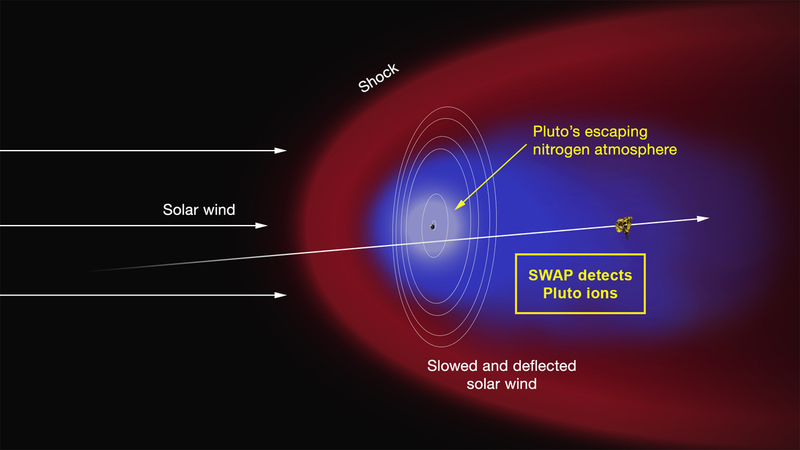 It’s hoped that this new insight into the nature of Pluto’s interactions with the solar wind will provide clues to how the planets of other stars are affected by the ionized winds in their own systems. The new study can be found in the Journal of Geophysical Research—Space Physics.